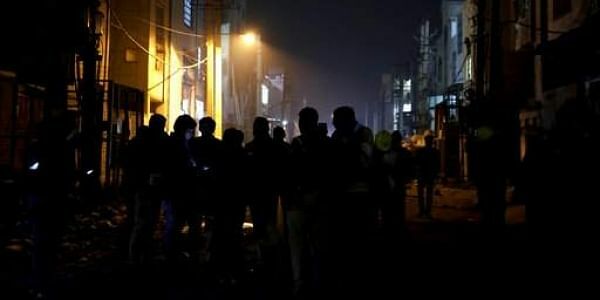 Crime Branch officials today visited the cold firecracker unit in Bawana where 17 people were killed in a massive blaze. NEW DELHI: Crime Branch officials today visited the "cold firecracker" unit in Bawana where 17 people were killed in a massive blaze on Saturday. The case was yesterday transferred to the Crime Branch from the district police as it "required extensive investigation and a proper detailed follow-ups". Of the 17 killed in the fire, 10 were women. Till yesterday, 14 of the deceased had been identified. Today, another body was identified as Avinash (18). Two bodies, including that of a woman, are yet to be identified. The crime branch team visited the site today to ascertain the reasons behind the fire. "Today, we visited the spot to get an idea of what had transpired that day. We also interacted with the probe team of the district police," an officer privy to the probe said. He said the team would talk to the survivors, Roop Prakash and Sunita, who saved their lives by jumping off the second floor of the firecracker unit. "We will speak to the workers to know the conditions they were working in and whether the unit was only used for packaging of firecrackers or for any other purpose as well," the officer said. Manoj Jain, who was running the firecracker unit, was arrested yesterday and is currently lodged in Tihar Jail. A Delhi court today asked the police to produce Jain before it on January 24. The officer said they will seek police custody of Jain. It is suspected that Jain was running the factory in partnership with his friend Lalit Goel, but that will only be determined after the rent agreement is recovered. Police are also on the lookout for Goel.